I didn't buy into this one. I was just... meh. And then the ending had implications that made me uncomfortable and I'm just very eh about this book. I normally love the style of letters and emails to tell an entire story but in this case it fell short. 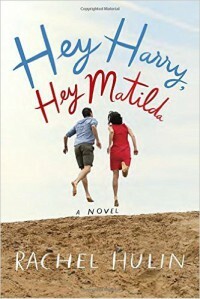 Harry and Matilda lacked distinct voices and if not for the changing of font I really wouldn't have been able to know who was who without looking at salutations. Both were also bland. English professors and wedding photographers sound like careers that would be very intriguing, but the two of them did not live up to expectations. If you asked me to describe a plot I'm not really sure where I'd go. The lie referenced in the blurb was barely a minor subplot point and didn't create the drama I expected. I'm not sure if they ever learned who they really were. The ending just really killed all of my enjoyment of this novel. I guess there was foreshadowing that I chose to write off as my imagination, but ultimately it was weird and uncomfortable. I've read a book with a similar topic where the author made it okay, but this felt left field. Interestingly, this was originally done as an Instagram novel. Fascinating concept. I wish the story had worked more for me.